A gated pathway leads one to the spacious parking area and the beautiful home, via a small covered porch one enters the living room consisting of a spacious dining room with a chimney, separating this area to the fully equipped kitchen is an american breakfast bar. This beautiful kitchen also has its own access to a side terrace. From the living room, a corridor leads to the bathroom with a bath and to the three double bedrooms, all with fitted wardrobes and two of them with air conditioning. The exterior is stunning and as well maintained as the interior of the house, all level and with two covered terraces, one with a barbecue and a summer kitchen. From here you can enjoy the views up to the mountains, the villages and the Mediterranean Sea: it is the perfect place to dine with family or friends! Next to this is the pool area with plants and grass, and from here you can also access an ideal area for those who want to create a vegetable patch. All this part has an automatic irrigation system. The plot leads down to the road side, so, you can also plant many fruit trees. It is the ideal property for those who want to come to Spain with their family, or live here permanently, but also for those who want to obtain income by renting it. 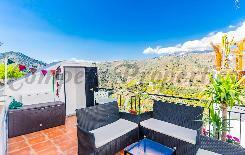 A house ready to live, in a lovely area and with fantastic views.